From the port of Sabtang, San Vicente Ferrer Parish will greet the visitors after the rough faluwa ride. It is such a relief seeing the church after a rough sail...naaahhh, just overeacting here, I am very thankful for seeing the beauty of Sabtang! It is such a great experience on the faluwa and then, Sabtang tour is on! Anyways, Brgy. Savidug stone houses is our first stop and have much learning about the stone houses. The designs of the houses signify something or has a specific function like as the main house, cooking house, toilet and bath house. The roof is always a thick bundle of a raw material covered with or without a net that can last 25-30 years. This structure can withstand earthquake and strong typhoon. The stone houses are commonly known as the Ivatan house. From the Brgy. Savidug, we then proceed to Brgy. Chavayan. There are more stone houses and it is where we can rent out an Ivatan protective handicraft: kanayi (for men) and vakul (for women). These are often used during farming or worn to provide warmth during cold rainy season. Wearing the traditional Ivatan protective handicraft (headgear) is such a cool thing to experience in Batanes. Only that you'll feel some itchiness with the material used, but it isn't an allergen, so no worries. Brgy. Chavayan is also a small community that tourists can walk along and have those Instagram pose and shot. From here, it is where we have had our so-called, "Runway Sabtang". 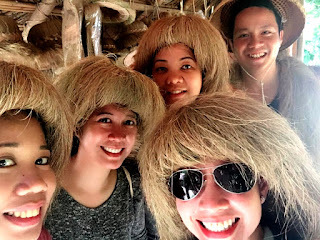 We have walked like in a fashion runway wearing the Ivatan handicraft. Isn't that amazing?!! Of course, it is! After such a modeling experience, we proceed to the Chamantad-Tinyan Viewpoint. The place is hilly which you need to trek a bit and see the beauty after a short while. After the photo opportunity at the viewpoint, back to the nearby cottages. That day of the tour is very hot and thus we need some refreshments. Guess what? Our refreshment is something different. Yeah, only in Batanes. They have free taste of "palek", an indigenous wine. The taste is surprisingly sweet for a fermented wine, I like it actually. You can buy a bottle of in the cottage and aside from the wine is the tubho tea, which I also like, also an indigenous tea. That is already half of the day trip in Sabtang. We will be back to the northern side of the island where we shall eat our lunch, just nearby our next destination. Great with this tour that we have our lunch every day. You'll have fresh seafoods and other dishes. Upon reaching our destination, our food is to be prepared. We are hearing huge waves touching the shore, and oh, the Morong Beach! The beach has white sand and nice waters, actually guests can swim here. But, as for us, we have much poses to do! There is also a natural limestone arc formation at the area. Indeed, such a beauty and natural elegance. That is such an experience in Sabtang. Very hot and tiring yet we have so much fun! After lunch, we proceed again to Sabtang Port going back to Mahatao and one of the lighthouses in Batanes that is in our view, the Malakdang Lighthouse. Back in Batan, it is already our free time to spend in our each accommodation. For me, a time to rest the whole afternoon and another chance to return at the view deck where I want to witness another sunset. It is indeed a fun-filled day in Batanes. Another day to spend the following day! If you want to read the first part of this adventure, click HERE. More of travel guide, click HERE. I hope you enjoy this post, there's one day more! Stay tune with the update and feel free to share this to your friends. Enjoy your visit in my avenue, www.ten7avenue.com!